If you're looking to dress up like a Star Wars Stormtrooper, we've got you covered. Below, we've listed out some of the best store-bought suits as well as some DIY options. As you can see in the table below, there are a variety of designs at different price points. Whether you're trying to dress up you child or attend an adult cosplay conference, there are a range of costume designs to select from. Over on Reddit one of the most popular Stormtrooper costume threads was started by someone looking for some DIY inspiration. This particular cosplay enthusiasts wanted to dress up for the Star Wars VII premiere. His problem was that he wanted something high-quality, but a lot of the options online got horrible reviews. One of the top recommendations was to go to Rubies Costumes. That said, if you really want to buy a permanent solution, you can do a lot of cool things with them like visiting children's hospitals and even in loaning it out on Halloween to other people who want to dress up. Another Redditor posted an Imgur gallery of a First Order Stormtrooper costume that he built for his young son. Remember, it's always an option to do a DIY style rather than resort to store-bought options. If you make it yourself, you can ensure that the material quality is good and that it will specifically fit the dimensions you require. The way this craftsperson built it, he purchased a 48" Stormtrooper doll and essentially enlarged it so that his son could fit inside. It was a pretty complex process and required a lot of screws and ingenuity to assemble it. For example, building out the right forearm required removing the support material, grinding all of this supports flush, and ensuring that there were not any pointy or sharp edges that might pinch or scratch his son's skin. Creating the back torso portion was also complex- he needed to get the internal strapping correct. He used black elastic straps and velcro to give it a finishing touch, any screw holes in the Star Wars armor he filled in with white patching plaster. Reddit commenters were impressed, saying that at the very least he and his son had collaborated on a fun, bonding DIY experience. Other users were impressed with the detail tutorial saying that the demonstrated shortcuts will help other users assemble it in less time. The original poster says that the biggest challenge he experienced was determining what was good enough, instead of over doing it to achieve unattainable perfection. Another poster submitted a question to the Star Wars Community, wondering where the best place was to purchase Stormtrooper armor. One poster joked that it is standard issue for all of the Imperial Infantry. One person who was in the process of constructing his own set, says that he purchase plasticine and plaster so that he could mold a realistic-looking helmet. 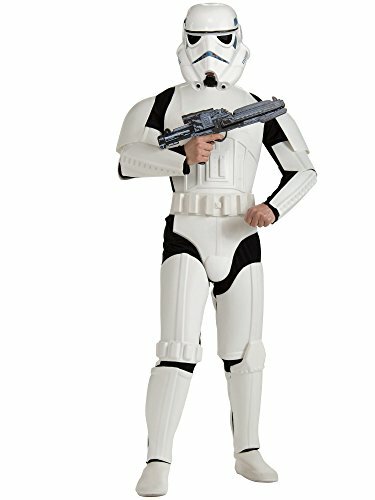 Another poster had a similar question, but was looking to invest a lot of money, not buy something cheap, when it came to a Stormtrooper uniform. In particular, he says that he was willing to spend up to $2,000 for a movie grade design. They posted a link to the Anovos website where a couple years ago a full version was for sale for $1,600 and a kit was for sale with a finished helmet for $650. With the kit, there will be some elbow grease required by then you'll probably have to do some assembly and trimming of the armor to get it looking the way you wanted to. 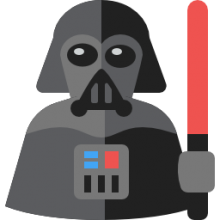 Others cite the 501st website, saying that this fan-based organization is a great resource because they commit themselves to providing information regarding building and wearing of screen accurate replicas of Star War characters. Another interesting take we saw showcased a dog dressed up in a Stormtrooper outfit. The clip comes from Instagram and serves as inspiration if you want to dress up your pet in a Star Wars - inspired costume. Just watch out when you try to dress up your cat- it's likely a lot more difficult than dressing up a dog. Another poster linked to an image gallery of different Stormtrooper designs, including a Range trooper, Mudtrooper, Imperial Patrol, and Mimban Stormtrooper from Solo. As you can see, these are quite different styles - one has a white fur throw coat, another a red cape that contrasts with an all black suit of armor, and the other seems to be decked out in some type of gold, marsh camouflage with a black leather cape. One Reddit user was somewhat cynical, saying that the reason why the Star Wars franchise produced these different variants so that they could sell more collectibles. Another user posed a question to the community, saying that he was looking for the most authentic-looking costume possible - though he didn't have a lot of money to spend so he wanted it on the cheap. One user said that the most authentic option available for purchase would be the eFX suit because it was cast from a screen used suit. Another person posted wondering where he could purchase just the helmet alone I've been he wanted to assemble a Halloween costume. In particular, he wanted to wear an all white tuxedo with just the helmet. Posters said that you can scour Amazon and eBay. With eBay, you can find some DIY, crafted options that would be singularly unique. Many of us know the infamous Star Wars for many things, but there are some elements have become synonymous with the movies such as holograms, lightsabers and most importantly Stormtroopers. But who are Stormtroopers? They are an elite fighting force from the Galactic dynasty under the command of Emperor Palpatine and his commanders Grand Moff Tarkin and Darth Vader. In early drafts of Ralph McQuarrie and Star Wars concept designs, the troopers were to wield handheld shields and lightsabers as normal weapons not limited to Sith or Jedi. In 1977 when creating background information on the Star Wars, George Lucas stated that no females existed in the Stormtrooper Corps, but they were a few based on the Death Star and several in other units. Stormtroopers were first introduced in 1977, they serve as the elite troops serving for the Galactic Empire, putting down any uprising and creating imperial authority. In the prequel Star Wars-Attack of the Clones premiered in 2002, the first clone Stormtroopers are cloned from Jango Fett, a bounty hunter and in Star Wars-Revenge of the Sith (2005), Palpatine orders the troopers to kill their Jedi generals during the Great Jedi Purge. Palpatine replaces the cloned troopers with conscripts of the empire and recruits. But the replacement of the clones with human beings only lowers the efficacy of the Empire army. With the empire experiencing full stability and Imperial Navy and Imperial Army established, the troopers are then integrated into Chancellor Palpatine army and then stationed on Imperial cruises and bases as well as on Death Star. After Chancellor Palpatine dies The Force Awakens premiered in 2015 the Stormtrooper continue serving under the groups that drifted apart from the Empire and with a whole redesigned armor, the troopers serve under the authority of the First Order. In the First Order, it is revealed that a number of troopers are kidnapped as young children and mentally controlled for loyal service. Stormtroopers have been featured in other Star Wars Legends expanded media such as comics and games. The DC Marvel-created comics of the early 1980’s and late 1970’s featured Shadow Troopers and other specialists including troopers and commandos specialized in working in the vacuum of the outer space. They have also been featured as Beach Troopers appearing briefly in the send installment of the Lego Star Wars and are dressed in a Speedo and a helmet. And in the first installment, the troopers also wear life-jackets. Additionally, Shadowtroopers are featured in Star Wars: Jedi Outcast dressed in a black armor that’s designed from a lightsaber resisting metal known as cortosis. The gear has a green synthetic gem that gives the troopers Force powers. The armor can also make them invisible but with only a minor area of discoloration selling them away. The Empire ground troops may enforce the law and calm down any revolt with no mercy, but they must look pretty awesome in their undertakings. There is the menacing snow trooper outfit, the sleek scout trooper uniform, and the layered Imperial combat driver fatigues. The iconic design of the Stormtrooper armor is intimidating yet futuristic and familiar. 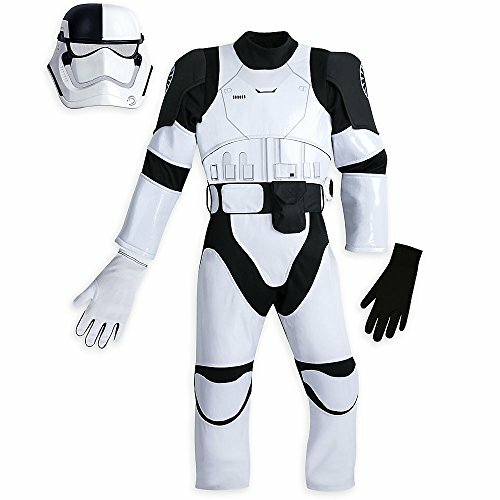 If you’re looking to buy a trooper costume either for yourself or your child, there are several factors that you should consider first. What you should note is that you should never use age or cloth sizing to select a costume. Costumes are designed different compared to normal clothing. There are costumes specifically designed for kids and others for adults. The costumes for kids include a jumpsuit and a mask, and it’s recommended for children from 36 months of age to 4 years. The mask doesn’t cover around the head but only covers the face through an elastic band that attaches with the Velcro at the back. For big kids from the age of 8-10 years, the costume comes with a mask, jumpsuit, and a belt. The jumpsuit features 3D boot-tops, high definition photograph-real printing, and foam armor detail.